Turn off Windows Update in Windows 10 Operating System – Many users put automatic Windows Update as we do not have much time to go and check for the updates and then update them regularly right? But sometimes, we need to Turn Off the Windows Update on our Windows Operating System but Windows 10 Operating System does not have an official option to do so unlike other Windows Operating System has. 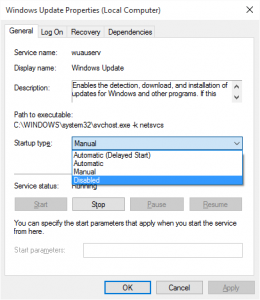 But, by using the steps mentioned in this article you can easily turn off the Windows Update on your Windows 10 Operating System as you need to follow them and implement them to disable or turn off the Windows Update in Windows 1o OS. You can see the option like Install Updates Automatically (Recommended), Download Updates but choose when to install them, Check for updates but let me choose whether to download and install them or Never check for updates (Not Recommended) on all the Windows Operating Systems. But not on Windows 10 Operating System. But if you have enough time to update your Windows 10 Operating System then you can update them manually. In Windows 10 Operating System, Microsoft has given two methods to update like for Home Users and Enterprise Users. These users have different methods to update their Windows Operating System. So in Windows 10 Operating System, you can disable or turn off the Windows Update by using the Windows Update Service. So to do so you need to go to Control Panel and then Administrative Tools. In Administrative Tools, you can see Windows Services Manager. Click on the Properties and then you can see the Windows Update option. In Startup Type drop box, choose Disabled and then click on Apply and then Click OK. But remember that as Windows is a Service, you need to keep updating it regularly. Updating the Windows Operating System regularly gives you the best features of Windows Operating System from Microsoft and you can see that all the updates are installed. So to do so go to Windows Service Manager and then Turn it on and then update the Windows Operating System. You can see a notification to update your Windows Operating System and then click on it update all the required files on your Windows PC/laptop. Sometimes in between, you can see that your Windows OS will stop working so be careful while updating. Check for updates regularly as it is important to have all features on our Windows 10 Operating System. Click on Check for Updates two to three times until it shows that all updates are installed on your Windows OS. After all the updates are installed then go to Windows Service Manager and then turn off the Windows Update again. So repeat the same process whenever you want your Windows 10 Operating System to get updated. If your Windows 10 Operating System has Group Policy then you can change some settings like Computer Configuration > Administrative Templates > Windows Components and then Windows Update. In right side window, you can see the Configure Automatic Update and click on Settings to set according to you. [Solved]-Stuck on Attempting Repairs? – Here is How to Fix It?